There can be no local history more widely covered than the incarceration of Charles I at Carisbrooke Castle. Historians characterise the king as a person of the highest moral standards who claimed unswerving fidelity to his queen. They therefore assume he suffered the withdrawal of marital rights during his eleven months at the castle with stoicism. Unfortunately most historians are serial victims of spin. They would have probably written up John Major as virtuous and faithful, but for Edwina Currie's disclosure. It only needs one revelation . . . While pursuing some local research, an Islander came across a peculiar item concerning Charles I awaiting execution in London. Although short on detail, it carries considerable implication. It is an anecdote recorded in The Moderate, a publication covering events at the time. "A gentlewoman big with child, some days before the king's execution, pretended she longed to kiss the king's hand; which, after some denials of the officers that attended him, was at last (considering her condition, though contrary to their instructions) admitted. After she had greedily kissed the king's hand, his majesty as eagerly saluted her lips three or four times. This gentlewoman is reported, by some that then knew her, to be formerly the black handsome maid that waited on him at the Isle of Wight." The meeting might have less intriguing connotations had the woman been a social acquaintance. But here we have a maid, who presumably served the king at the castle, now pregnant and desperate to see him, whom he greets in an extremely intimate manner. Perhaps somebody can suggest an innocent explanation, although it won't be half as interesting as the possibility of the king being responsible for her condition. The terminology used in saying she was a 'gentlewoman' but 'formerly' a 'maid' may not be significant, but it could indicate the rapid social advance that can be made if your immediate superiors know you're carrying the king's child. The closing sentence could be interpreted as the writer questioning her status. This insight follows the recent claim that a cipher in the king's letter to a female acquaintance was not as innocuous as had previously been assumed. Sarah Poynting of Keele University says he was in fact inviting the lady to visit the castle so he could give her a swiving: a period term that would demand asterisks in today's equivalent. The idea of a 'black' maid being impregnated by the gentry in 17th century Isle of Wight is not as unlikely as it might seem. In the 16th century, Sir Richard Worsley indulged with one of his mother's maids, Jane Meadmore, who duly fell pregnant. Sir John Oglander describes her as "a handsome black wench, whose friends dwelt at Northwood." Jane probably found herself back at Northwood following the birth, while her son, Thomas Worsley, was eventually granted the old manor at Chale Farm. It would be piling speculation upon speculation to suggest a sexual indiscretion by Charles I at Carisbrooke Castle resulted in his illegitimate black offspring being raised locally. On the other hand, even as a long-shot, it does fulfil the Island's need for interesting alternative to the exhausted story of his attempted escapes. The council project to create a one-stop Isle of Wight Heritage Centre has completed its audience development stage. The next stage will involve arriving at a firm plan for the location and design, before applying for grant funding. The report on consultation shows the preferences of Islanders and their views on the relevant council services, and this will inform project development. The idea of a new heritage centre arose, in part, out of necessity. The County Record Office has neither the space nor the environmental and security controls necessary to meet government standards. Unless some action is taken, it seem likely National Archives will insist much local material be moved to more suitable premises on the mainland. This will obviously put local researchers at a disadvantage and probably discourage Islanders from donating further items to council archives. Any new premises will have to be met by grant funding. The decision to include the full range of heritage facilities in the centre not only makes an application more feasible but also overcomes many shortcomings inherent within current facilities. The proposed centre will now embrace the record office, archaeology centre, local collection and museum storage. It will also include meeting rooms and presentation facilities. It is undecided as yet whether it will include museum displays or catering services. The main advantage lies in a one-stop facility for the public but there should also be some economies in amalgamating overheads and administration. The consultation report gives an insight into the priorities in people's local history pursuits and their views on existing facilities. Apart from the general interest in IW history, the predominent specific pursuits were family history, archaeology, maritime history, natural history, geology and the history of the family house. Other interests included industrial archaeology and military history. In general people found staff at the existing centres helpful and enthusiastic. Some criticisms of the present arrangements are matters the new premises will seek to address, notably the impracticality of pursuing subjects across locations as far apart as Clatterford, Newport and Ryde. Some also felt people were discouraged from using the services because they appeared too uninviting. It was also noted that many people are unaware the facilities exist. Although the consultation included a few who don't use the existing services, the views mainly represent core users. Almost all of them were over 45 years old, with the largest group in the 55-64 bracket. In the long term the age imbalance can be partly addressed with a concentration on education services, looking to create lifelong interests. Nevertheless, a successful grant application will have to show the centre can attract a wider community in the medium term, while still meeting the needs of core users. The advantages of a one-stop centre should automatically improve attendance but the report inevitably enters into speculation when it comes to the level of potential visitors. On the face of it there is considerable opportunity. There can be no doubt local history is a major interest on the Island. Our prominant visitor attractions are probably the equal of most counties, but it's the extraordinary number of local history organisations that suggest an exceptional degree of involvement. Some, like East Cowes Heritage Centre, provide an object lesson in how to 'sell' history. There is also a healthy interest via the Internet. Visits to the combined links listed on our own web page probably run into many thousands per month. Unfortunately local history organisations tend to be strictly parochial and web visitors are often content to be armchair researchers. Although the consultation questionnaire was widely publicised, the fact that there were less respondents than expected suggests there are many who remain a challenge for any new centre. In the past the council's heritage facilities have suffered from a rather conservative culture, sometimes being among the last to embrace trends in public expectation and new developments. The concept of a new one-stop premises suggests a more progressive approach. Maintaining a broader outlook will probably be essential for a successful grant application and realising the potential thereafter. In our news item of December 2006 we reported on the major historical environment assessment of the Medina valley environs, implemented by the County Archaeology Service in preparation for the Island Plan. A key part of the programme was commissioning a geophysical survey of the lands either side the river. This survey has now been completed and the report indicates a number of potential archaeological features. Initially a reconnaissance survey was carried out over an area of 100 hectares on the western side of the river but only 22 hectares on the eastern side, where the permission of landowners was less forthcoming. This was designed to quickly scan the ground for areas of possible past human activity. The scanning survey was followed by a detailed survey of 14.9 hectares on the western side and 1 hectare on the eastern side, to try and identify potential new sites. The western survey covered an area running from Somerton Farm down to Werrar and produced a range of interesting features, particularly in an area surrounding the Chawton settlement. Geophysical instruments can detect buried features when their electrical or magnetic properties offer significant contrast to their surroundings. The results do not guarantee archaeological features but the intensity, depth and type of response can identify the most likely candidates. The examples below show selected detail from the survey, based on a summary raised by County Archaeologist Ruth Waller. The blue anomalies are thought very likely to represent archaeology. The green may have profiles that would also justify excavation. The grey shows an increased magnetic response over broader areas. The plan below is of an area to the east of Somerton Farm and demonstrates the level of detail revealed by the survey. 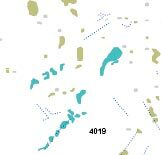 It shows a concentration of pits and linear disturbances which are of archaeological interest. 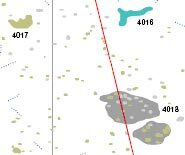 Anomaly 4004 is of particular interest, showing a group of pits, probably filled with burnt or ferrous material, that form a circular feature over 14 metres wide. 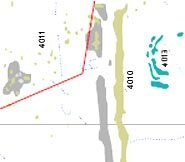 Anomaly 4006 consists of several rows of pits covering an area 24 metres by 7 metres and is next to linear feature (4007) which runs for a length of 35 metres and ends in an angled ditch. Plan at right covers just part of a survey directly to the east of the Chawton settlement, where Roman pottery and building material has been recovered during field-walking. The area has some spectacular linear features, one of which is 270 metres long. A number of small pit-like anomalies may be interrelated. The most interesting item is anomaly 4013 which is a composite of features of the same character, creating a semi-circular shape measuring approximately 25 metres by 9 metres. The area at right lies immediately south-west of Chawton and provides several anomalies of archaeological interest. Of course, without excavation, there's no way of telling what period any of these readings represent, or which are merely geological anomalies. Nevertheless the survey's Chawton features, coupled with Roman finds, indicate an important site. The shipping of industrial and farm produce would be a natural development along the Medina, so it wouldn't be surprising if there are associated buried features covering many different periods.